So. Why not take the idea described in my last article to even more absurd extremes. Yes, it’s the Narcautism Spectrum! This invaluable tool for study was tweeted to me by a blogger, Don “Dr.” Depresso, who was inspired to send it to me because of the article I posted earlier tonight. All kidding aside, the chart does make sense, but I’m trying to figure out how “malignant narcissism” is where it is on the chart. I think it refers to the fact that MN’s have a high level of cognitive (“cold”) empathy–they KNOW how you feel, and use it against you. It looks like the “intersection” would be where non-narcissistic neurotypicals (most people) would be. The Schizoid is a complete droid–no empathy (either warm or cold) and no social skills. 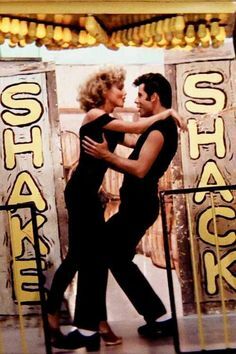 Narcissism and autism–they go together, like rama lamma lamma ka dinga da dinga dong. 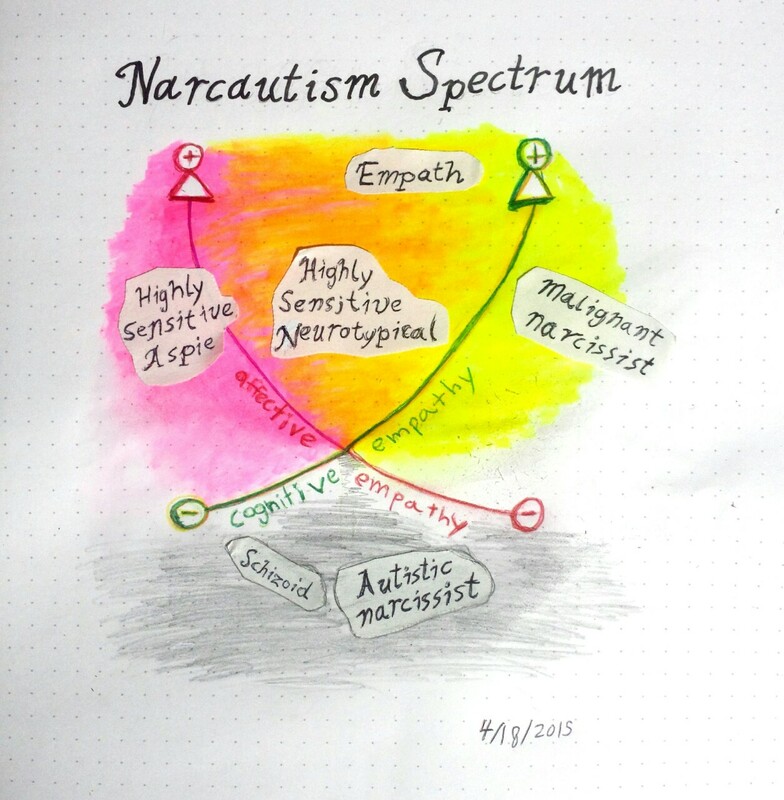 Narcautism Spectrum = intersection of narcissism and autism spectra, shown across two dimensions of empathy. Low affective empathy (not caring how people feel) is related to narcissism, while low cognitive empathy (not knowing how people feel) is related to autism. Chart not drawn to scale. The idea to draw this chart came from reading the article “Do You Think of Narcissism as an Autistic Spectrum Disorder?” in Psychology Today. Don Depresso, you rock my world! People with Aspergers may SEEM unempathic, because they are not always very good at expressing emotions or knowing how to react when other people share their emotions with them. But an Aspie’s lack of appropriate social reaction to the emotions of others doesn’t mean they can’t FEEL the emotions around them. 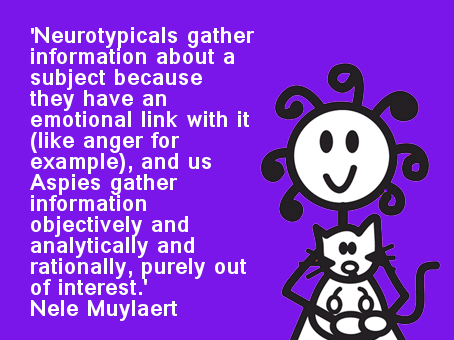 In fact, some may feel other’s emotions MORE keenly than neurotypicals, and they can be easily overwhelmed, which may cause them to withdraw from the situation and partly account for why they may seem less engaged emotionally or uncaring about the feelings of others. Narcissism as an Autism Spectrum Disorder? Khalid A. Mansour (the British Arab psychiatrist), has proposed in an article in the Pan Arab Journal of Psychiatry (link is external) that narcissistic personality may merit classification as an autistic spectrum disorder. Interesting. When I first read the above paragraph, I though Dr. Mansour was writing about severe narcissism. His description fits both narcissism and autistic spectrum disorders. Hmmm. –Poor ability to reciprocate emotions. –Hostile dependency on safe relations. Again, this list certainly sounds a lot like narcissism. I don’t buy it. This is the opinion of one psychiatrist. 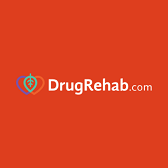 While it’s true that on the surface these two disorders may appear similar, the mechanism behind the behaviors are vastly different–in fact, almost the opposite. For the narcissist, their lack of empathy and failure to engage the emotions of others is due to their inability to feel the emotions of those around them, but they can FAKE empathy fairly well, even if they choose not to. If they are trying to obtain supply, they can be pretty good at it. Their social skills are not the problem–their inability to feel other’s emotions are. They are like actors in a play. In contrast, a person with Aspergers or high functioning autism DOES feel the emotions of others around them strongly, but lacks the social skills necessary to be able to convey this to others effectively. Unlike the narcissist, people with Aspergers are very bad actors. But the question was, can Aspergers and narcissism occur together? But we’re talking here about comorbidity. The question I’ve raised is whether Aspergers and Narcissism can be comorbid with each other–that is, can someone have BOTH disorders? 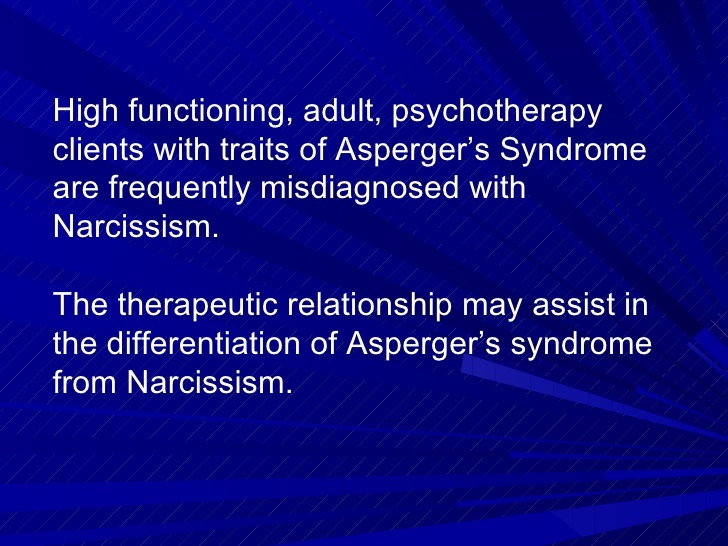 […] people with Asperger’s can be sociopaths and or narcissists as well. “CO-MORBID” is the medical term used to describe a disability or group of disabilities that exist another disability in a single individual at the same time. It is possible to be autistic and have cerebral palsy or have aspergers and diabetes. Likewise it is also possible to have both Aspergers and mental disorders including sociopath and narcissism. 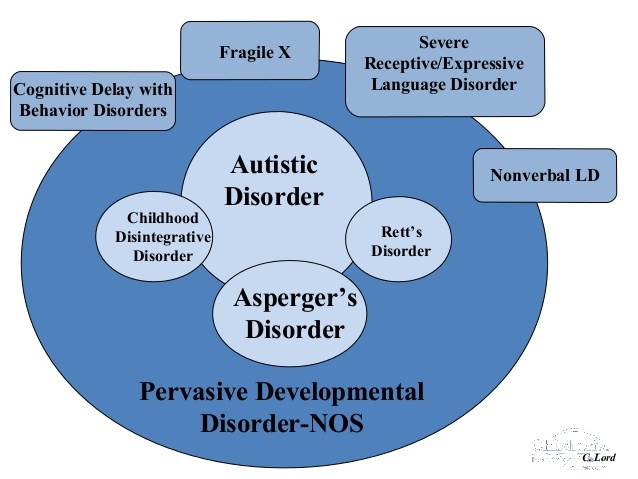 Asperger’s does not exist in a bubble that protects it from co-morbid disabilities and mental defects. I have High Functioning Autism and I also have antisocial tendencies I must always keep properly managed. I see my psychiatrist regularly. I take my medications as needed and I have trained myself to always be mindful of my darker instincts to insure they do not express themselves in disastrous ways. I have high functioniong autism but; thanks to early intervention by family, doctors and others I was made keenly aware of my antisocial ways and taught how to manage them in ways that kept everyone safe. It is the single most difficult thing I do in life to keep my antisocial ways well managed but; having seen the monster I become when enraged is motivation enough to keep me always vigilant. There’s no reason why the disorders couldn’t exist together. Personally, I’ve never known anyone with both disorders, but that doesn’t mean they don’t exist. Using a fictional example, I’m going to speculate here what the behavior of a narcissist with Aspergers might be like. The Case of Mark F.
Mark F. always had trouble making friends. 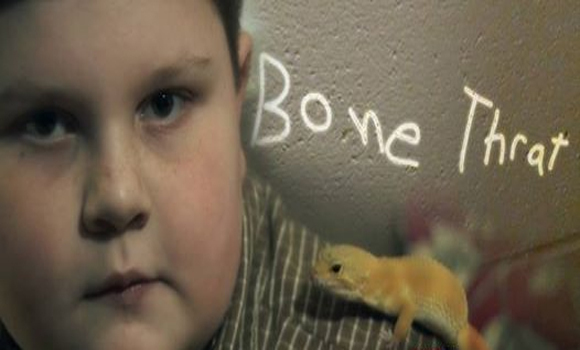 In grammar school he was bullied due to his inability to fit in with others or show empathy. He was socially awkward and never seemed to know the right thing to do or say. Mark not only was unable to show appropriate reactions in social situations, but rather than suffer in silence and wonder why others didn’t understand or like him (as most Aspies do), he didn’t care about the feelings of those around him. He was easily hurt by the bullying, but reacted in rage due to these narcissistic injuries to himself. He’d lash out at those who injured him and didn’t care if he hurt someone else. As Mark grew older, he had difficulty keeping a job, not only because of his inappropriate, almost schizoid affect that was very offputting to those around him, but also because he deliberately caused pain to others with his frequent insensitive insults. Due to his Aspergers, Mark lacked the social skills to be able to effectively use the more subtle narcissistic “tools” such as gaslighting or triangulation against others, but he was very good at blame-shifting and projecting his character defects onto those around him. Lacking the social skills to know what behaviors were appropriate, he’d “go off” on those in authority, and was frequently fired from his jobs for insubordination, gossiping openly about his coworkers, missing work due to debilitating hangovers (more about this in the next paragraph), and starting fights. Mark never married. Though good looking, due to his poor social skills and openly hostile attitude (he was unable to mask his anger, resentment and envy of others), his dates never developed into relationships. No woman would stay with him longer than a few weeks. 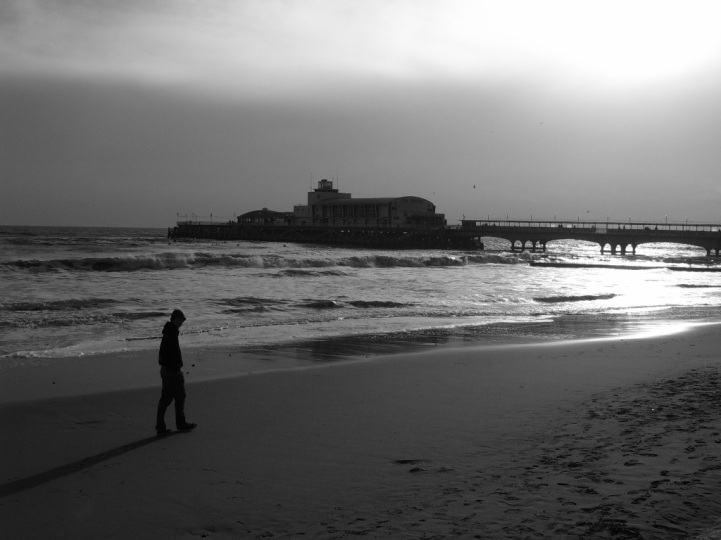 He had no friends and resorted to frequent drinking to cope with his loneliness. As you might imagine, Mark was miserable. He constantly felt victimized. He was frequently depressed and wondered why he couldn’t get others to cooperate with his need to use them for supply. 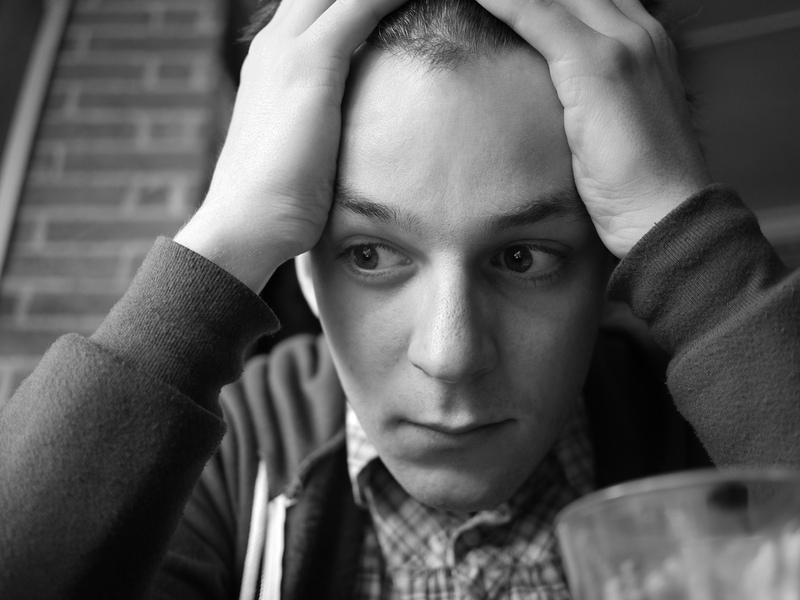 In his frustration and envy of all those around him for their “better social skills,” Mark tried to self-medicate by drinking heavily and his frequent drunkenness only served to exacerbate his rages and cause his work attendance to be poor. Having both disorders would be a recipe for extreme misery. Mark’s behavior is just one way narcissism comorbid with Aspergers could manifest itself. An effective narcissist must possess good social skills to be able to charm others into trusting them and to use their “bag of tricks” in an effective way, and therefore an Aspie with narcissism wouldn’t be particularly dangerous, just very unlikeable. Therefore, I don’t think it would be probable that an Aspie could be a “malignant narcissist” but they certainly could be suffering from NPD. A person with both disorders would have zero charm and therefore not have many opportunities to use others the way a narcissist with good social skills could. My feeling is substance abuse would be a huge problem for such a person, in their attempt to make life more bearable. 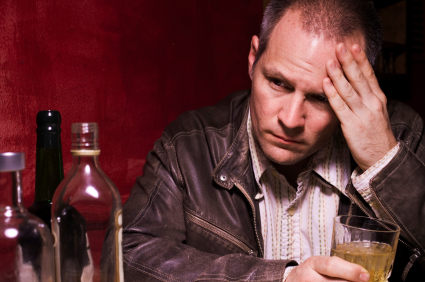 For those not resorting to substance abuse or alcoholism, severe depression or even suicidal ideation could result. Zero tolerance has gone too far. I’m getting to the point of having zero tolerance for zero tolerance. Between this and “political correctness,” it seems people have no right to free speech anymore. Whatever happened to the first amendment? Silencing is a major way narcissists gain control, and Americans are living in an increasingly narcissistic society. All this zero tolerance/political correctness BS is The Narcissistic Powers That Be showing its paranoia and exercising control over the rest of us peons. My fellow ACON blogger Fivehundredpoundpeep, posted this the other day. Aspies are knowledge junkies. We can become Internet addicts because the Internet is like crack for us. I study many things for the fun of it. 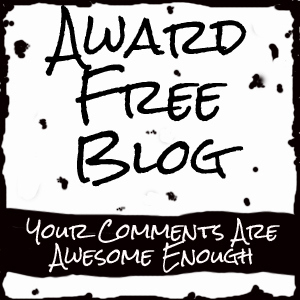 You all see what I write on this blog but this week, I read about True Crimes in my state, Indian nations in America and Outsider Art. There was never anything truer than this. In my many years of prowling and posting on the Internet, Aspies do seem more numerous than they do IRL. On a forum I used to be active on, Aspies seemed almost proud to say they were Aspie, as if it’s an advantage on the Internet instead of a liability. But guess what. It just may be! We do tend to become obsessed with one or two topics at a time and focus intensely on them to the point others sometimes think we are weird (the extreme form of this is the idiot savant phenomenon seen in low functioning people with autism). That’s why I blog! Because if I just talked about the stuff I talk about here IRL as much as I do on my blog, people would be backing away slowly and locking their doors and windows against the crazy woman on the loose. We read a lot and gain a very deep knowledge of what interests us. We read anything we can about our obsessions until we’re sated or the next obsession takes over. 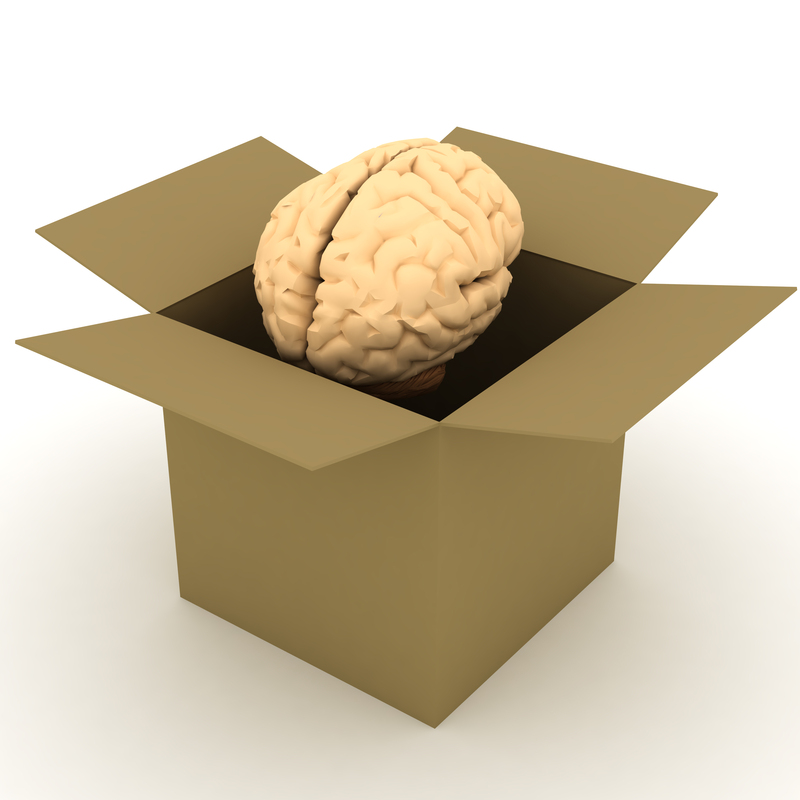 We have good memories and retain new information well. These traits can give us some credibility in whatever topic we focus on in our blogs. I think that’s a good thing. Our obsessing over topics and spending so much time researching and reading about the minutiae of that focused interest may seem strange to neurotypicals, but it’s hurting no one, so why is it a problem? The Internet is the perfect modality for most people with Aspergers. It allows us to have a platform to talk about our obsessions instead of having to engage in shallow conversation or small talk (which I hate and am very bad at). It even allows us to start a conversation about our pet topic and the metaphysical, meaningful aspects of that topic. People can think we are weird or insane, but we don’t have to deal with those judgmental NT’s face to face. There are plenty more people online who actually like what we have to say and listen to us. We also have time to think about and refine what we want to say. 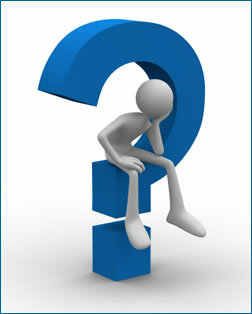 We’re not required to “think on our feet,” something which is very difficult for Aspies. We don’t have to have a witty comeback for a joke or know exactly the right or appropriate thing to say when confronted by something. Because our problem isn’t really that we lack social skills. I think for most of us, the problem is that we need time to process an interaction, and you can’t do that in real life social situations. Writing is just as valid a form of social interaction as speaking, and it’s a modality most of us are much better at and even find we can excell at. The Internet can make us feel more confident. It’s the one thing Aspies have going in their favor that we never had prior to the late 1990s. 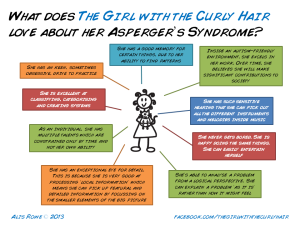 There’s also more general knowledge about Aspergers and it’s now acknowledged even adults can suffer from it. In the past, Aspergers wasn’t even recognized as a high functioning form of autism. We were just the geeks and dorks and socially awkward outcasts and obsessive crazies of the world. When people used to think of autism, they thought of people so impaired and disconnected from the world they had to live in institutions and have all their needs met by caregivers. They didn’t think of socially awkward geeks and obsessives like me. Now they do, and it’s because the Internet has given us Aspies a place to talk, to meet others like ourselves, to make friends, to vent and rant, and to protest against the prejudices neurotypicals have against us. We are really more a minority group like LGBT than we are “mentally ill.” (Homosexuality used to be considered a mental illness too–it was finally removed from the DSM in 1973). 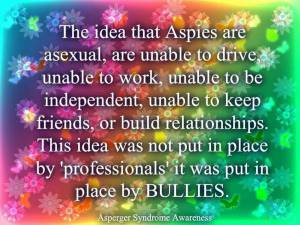 The Aspie rights movement thinks of Aspieness as a variation rather than a disorder. We’re only “disabled” because our society isn’t set up to be adaptive to our needs. We are forced to adapt to theirs, and it ain’t easy! The Internet gives us a voice. I wonder if it’s common for people with Aspergers or high functioning autism to come across to others as lacking basic intelligence. I think people’s behavior toward me is because as an Aspie, it’s so difficult for me to process the things people tell me in a normal way, especially when I’m forced to deal with people in a group setting. I am also almost silent due to my shyness and unwillingness to get involved in social conversation. That probably makes me seem a little dim too. I don’t hear that well either (I have only 20% hearing in my left ear due to having severe ear infections as a child), so that makes it even harder for me to understand what people say. I often have to ask them to repeat what they just said, which irritates both me and others. I’ve told people I have bad hearing, because being asked to repeat something annoys people less if they know there is something wrong with my hearing. I find social chatter and small talk overwhelming and it’s not fun for me at all. It’s a lot of work for me to process all that. Of course there are some people who just intimidate me anyway (probably narcs) and I totally clam up around them and act really stupid and inappropriate when I’m forced to talk to them or ask them a question. Socializing is just so difficult! NT’s love it. I don’t. Of course I’ll never say this. But I wish I could! Having Aspergers and Avoidant personality disorder combined with only partial hearing really is a handicap to dealing with the NT (neurotypical) world. People who love me and know me well, and people who read what I write know I am not stupid. Autism and narcissism have a few things in common: First, they are both spectrum disorders. With autism, the spectrum runs from mild (Aspergers, colloquially known as “geek syndrome”) to full blown autism so severe the patient seems retarded and cannot even perform the most basic self-care or live without full time supervision. 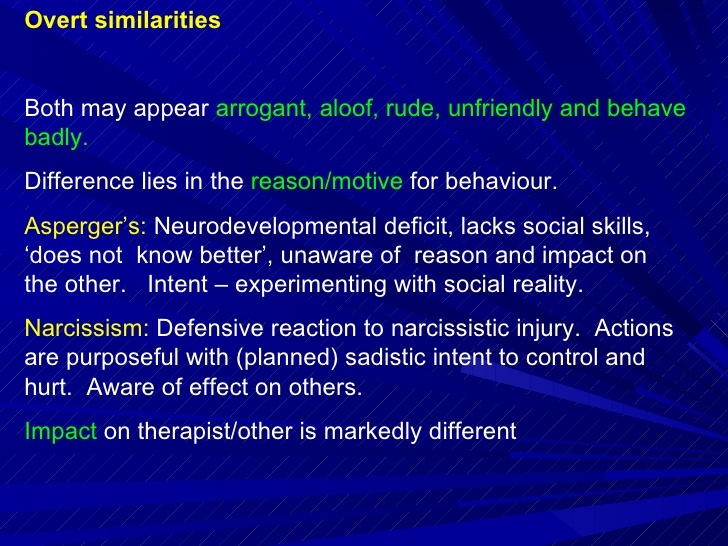 With narcissism, the spectrum runs from “benign” narcissism (people who are self-centered and vain but not completely lacking empathy or a conscience and don’t deliberately want to hurt anyone) to full blown malignant narcissism/psychopathy (which are basically one and the same). Second, they are both at least partially (in the case of autism, probably totally) due to a miswiring or malfunction in the brain. One can be born without the ability to love or feel empathy (though abusive parenting does seem to exacerbate an inborn tendency), and almost all persons with autism were born with it (although there does appear to be a suspicious correlation between Aspies and narcissistic mothers, which probably exacerbates the Aspergers symptoms). In one important way, autism and narcissism are mirror-images of each other. Narcissists cannot feel empathy for others, but can fake empathy quite well if they wish to. They can be very good actors. People with Aspergers (or mild autism) have the opposite problem. They can feel the emotions of others around them (very keenly in fact) but due to their inability to read social cues and difficulty acting “appropriately” in social situations, they can seem unempathic because they can’t express their emotions well. 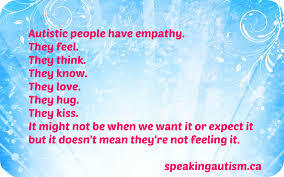 Due to their difficulty showing empathy (people with Aspergers can seem aloof, cold or just awkward) it’s become popular to believe that people with Aspergers or autism, just like narcissists, do not have empathy. M. Scott Peck’s book “People of the Lie” is one of the best books I’ve ever read about malignant narcissism (it wasn’t called that when the book was first written in the early ’80s), but there was one thing that really bothered me: Dr. Peck used the term “autism” a number of times to describe the psychopath’s inability to feel empathy. Nothing could be further from the truth. Here is an excellent article that makes mincemeat of this popular notion. If anything, people with mild autism/Aspergers empathize too much. I would even go out on a limb and say most of them are also Highly Sensitive People (HSPs). HSPs worry excessively about the impression they are making on others and whether or not they’ll be liked–and that sort of anxiousness itself can be socially disabling, even if no autism is present.